The shop that did the extensive amount of work I had done on my car last year may have shut down, so I went to a new place for my new brakes and clutch. 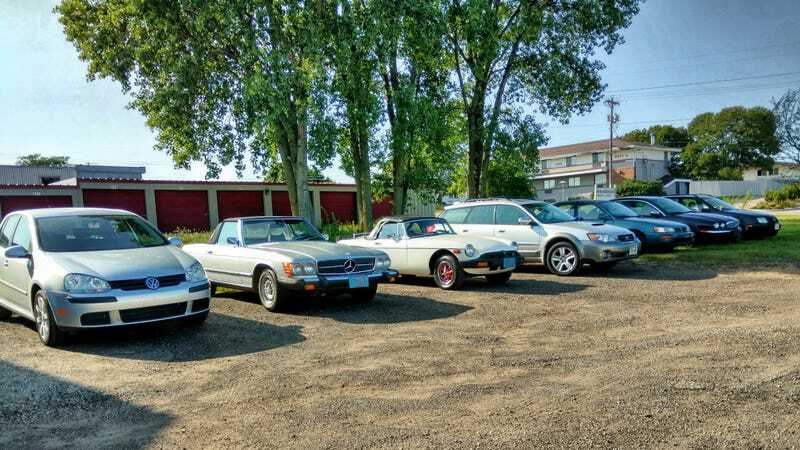 I went back today for a minor follow-up visit, and these are all the cars waiting to be picked up. There was some kind of tweaked E60 5-series there that a guy picked up while I was there that didn’t make it into this picture. The guy who picked it up was rather large, gruff, MURRICA looking fellow who mentioned that he works in plastic injection molding manufacturing and has the next month off work. I’m sure BMW marketing folks would be appalled at his appearance. Welcome to Wisconsin, I guess. I’m actually much happier with this shop than the last place, both because they fixed a couple issues related to work the last place did, and because the last place didn’t have any front desk with a person answering the phone, just the couple mechanics, and they were annoyingly difficult to get a hold of. Shoutout to Foreign Car Specialists in Madison, WI. Maybe I should write them a positive Yelp review. ...but here’s mine in front of the place today.